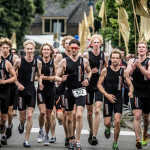 Wouter completed the Ironman in Frankfurt, last Sunday! He actually became the 5th person ever to do that! He crossed the line with his sports physician Guido Vroemen, a special guy who did the whole bike course and the marathon with Wouter. It was truly amazing to watch your special friendship and your outstanding accomplishment in sports. So proud of you both!